Sour cherry is believed to have been originated in southeast Europe and western Asia as a hybrid between sweet cherry (Prunus avium) and wild cherry (Prunus fruticosa). 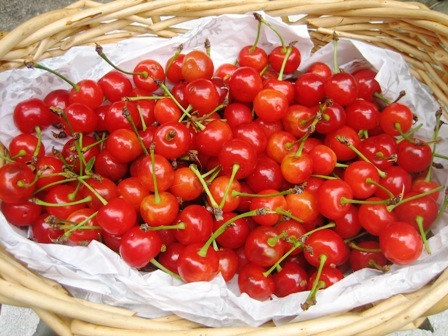 Sour cherries are under cultivation in Asia Minor and southeastern Europe since ancient times. These were spread throughout Europe by the Romans. Presently, sour cherries are grown commercially all over the world in cold temperate parts. 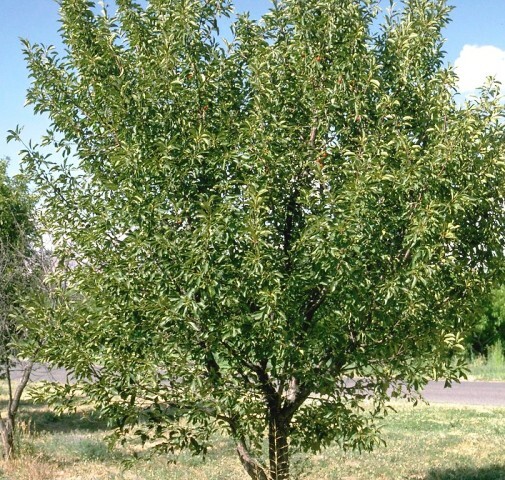 A small, irregular-growing, deciduous tree, 7-9 m high with broadly rounded crown; twigs medium textured, gray-brown; buds reddish brown, spurs with multiple terminal buds; bark red to gray-brown, tight but somewhat rough, with prominent horizontal lenticels; often peels. 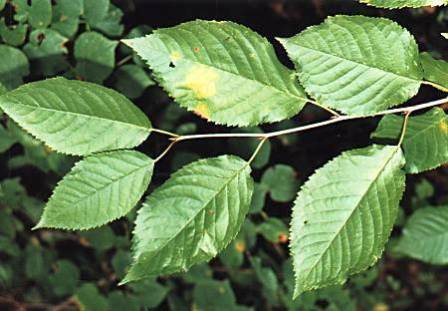 Leaves alternate, 5-12 cm long, oval to obovate, serrate margins, obvious darkened glands on petiole, generally with less than 8 pairs of veins. Flowers white, petals 5, 3 to 5 per cluster. Fruit globose, dark red to black globose or ovoid drupe, 10-15 mm wide, usually clustered on spur shoots. As indicated by name itself, sour cherry fruits are sour in taste. These are therefore mostly mainly used for making jams, preserves, culinary purposes. The fruits are reported to have much higher level of vitamin A than sweet other cherries. Sour cherry fruits are candied too. These are are also popular for making alcoholic beverages such as cherry wine or cherry liqueur. Especially famous are cherry brandy from England, kirsch from Alsace (where they also make savoury cherry soup on Christmas Eve), Maraschino from Italy and various cherry liqueurs (such as the French guignolet made in Anjou). A semidrying oil can be extracted from the kernels and used as a salad oil and in cosmetics. A gum obtained from the fruit stems is used in cotton printing. Leaves are brewed as tea. The wood from sour cherry tree is hard and durable. It is used for turnery, inlay work, furniture, and instruments. 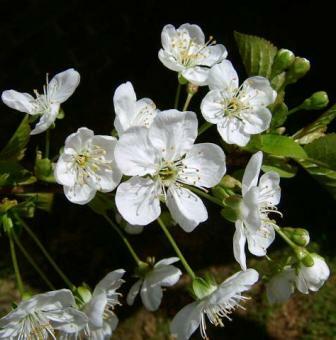 As stated earlier, sour cherry is being cultivated since centuries for fruits and other uses. It also makes a nice flowering tree. New plants are raised by grafting. Two varieties, viz. amarelle cherry and morello are well known. Amarelle has light to medium-red fruits with light-coloured or clear juice and a relatively low acid content. Morello has rounded, dark red fruits yielding red juice with a high acid content. Sour cherry is self fruitful.